The all-new Range Rover Evoque has been wildly successful around the globe and Land Rover is building on that success with the introduction of a new 2013 Evoque Sicilian Yellow Limited Edition model which made its debut at the Brussels Motor Show this week. The Range Rover Evoque continues to be Land Rovers most popular model selling in excess of 100,000 vehicles in its first full year of sales. And buyers around the globe keep adding to that number as the new crossover continues to show rapid growth worldwide. When Land Rover introduced the new Sporty SUV, it got immediate attention for its new concept-looking design. Since its launch, the Evoque has received over 120 international awards and was recently named SUV of the Year by Esquire magazine. This spring, the 2013 Range Rover Evoque will add to the success with the new Sicilian Yellow Limited Edition model that comes with a number of unique features that will set it apart from the crowd. The new Limited Edition Evoque crossover will be based on the 2013 Evoque Dynamic Plus model and has a striking appearance. Land Rover wants to continue the global appeal of the 2013 Evoque and is featuring the new Sicilian Yellow Limited Edition that will be available in both the coupe and five-door versions. If you don’t like yellow, don’t worry because the new Limited Edition Evoque will come in two color schemes. Choices include a Sicilian Yellow exterior body finish with a Santorini Black contrast roof, or a Santorini Black exterior body finish with a Sicilian Yellow contrast roof and door mirrors. Each one will be totally unique to the Limited Edition model and based on a new Black Design Pack that makes its debut on the new model. The Black Design Pack will be available independently of the Limited Edition starting in April 2013. The new Black Design Pack will be available exclusively on Dynamic models and will feature unique exterior treatments. It will come with a rear sport spoiler, darkened front headlights and fog lamps, black Range Rover lettering, clear rear lamps, 20-inch Gloss Black forged wheels, Santorini Black painted bumper sections and dark exhaust tips. The unique treatments continue on the inside with the new Evoque with Black Design Pack getting interior finishes that include yellow contrast stitching on seats, central storage area, door trims and fascia mid-section, plus an anodized yellow horizontal finisher. Land Rover understands they need to continually add new features to the Evoque and they can’t rely on past successes to keep the new crossover selling well. The new Limited Editions and Black Design Packs are designed to give the Evoque a fresh appeal. John Edwards, Land Rover Global Brand Director said, "The Sicilian Yellow Limited Edition is the perfect opportunity to introduce the Range Rover Evoque into 2013 and build on what is already a tremendous success story. Such a striking colour combination attributes itself to the already unique styling of the Evoque. This, combined with the release of the Black Design Pack in April, will provide customers with yet more appealing and unique choices." Here in the U.S., both five-door and coupe models are powered by a 2-liter, 240-horsepower direct-injected turbocharged 4-cylinder engine, which is mated to a six-speed automatic transmission and a full-time, intelligent four-wheel drive system. In Europe, buyers have the choice of two fuel-efficient and powerful diesel engines with a choice of a six-speed manual or a six-speed automatic gearbox. 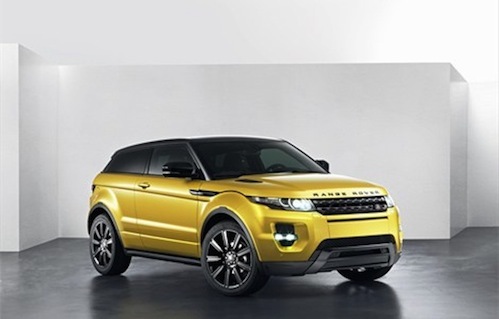 Orders for the new 2013 Range Rover Evoque Sicilian Yellow or Santorini Black Limited Edition and new Black Design Pack models are being taken now with deliveries beginning in May. The global appeal of the new 2013 Range Rover Evoque should continue.